This volume analyzes the political, economic and strategic dimensions of the recent upheavals in the Middle East known as the Arab Spring. Mass demonstrations in many Arab states challenged the political status quo and the existing political and cultural system in the region. While it is too early to offer a definitive analysis of the impact of the widespread discontent in the Arab world, the trajectory of the events indicates regime change in several states, containment of political unrest in most states, increase in Islamic tendencies, centrifugal tendencies in a number of political units and deterioration of economic conditions. 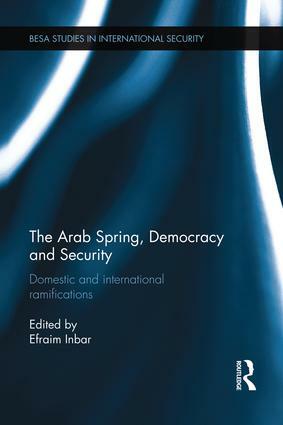 This volume presents an initial assessment by a selected group of Israeli scholars of the implications of the Arab Spring. The chapters focus on important issues such as democratization, the role of economic factors in political change and explanations for variations in regime stability in the Middle East. Taking an international relations perspective, the book not only examines the evolving regional balance, but also explores the link between external and internal politics and the implications of terrorism for regional security. The chapters also address the implications of the Arab Spring for Israel and its chances of existing peacefully in the region. This volume will be of much interest to students of Middle East politics, international security, foreign policy and international relations. Efraim Inbar is Professor of Political Studies at Bar-Ilan University and the Director of its Begin-Sadat (BESA) Center for Strategic Studies. He has written five books and edited several collections of articles.